Coleslaw is an American standard during summer, especially at cookouts. Thing is, most versions are drowned in mayonnaise and sugar. So I created this simple yet satisfying version, inspired by one of Skye Gyngell's salads, a new standard. It combines red cabbage with grated beets to add a pop of color to any table. The vegetables are complemented by a creamy silken tofu-based dressing. In general, this crunchy salad is juicy and refreshing. Place the cabbage and beet in a medium-size bowl, and set aside. In an upright blender, combine the lemon juice, vinegar, mustard, garlic, 2 tablespoons of the parsley, agave, ½ teaspoon of salt, and tofu. Blend while slowly adding the oil. Season with salt and pepper to taste. Pour just enough dressing over the bowl to moisten the vegetables (reserve the remaining dressing for drizzling on the salad before serving). With clean hands, massage the contents of the bowl until wilted, 3 to 5 minutes. Stir in the pecans. 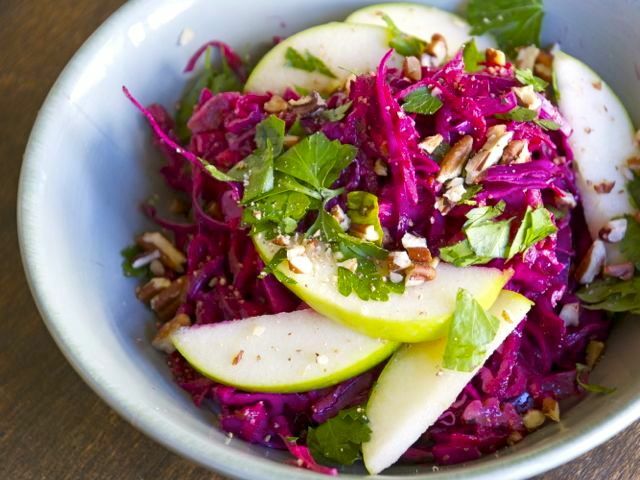 Serve the individual plates by layering an apple slice, topping with slaw, repeating once, piling it high. Drizzle with remaining dressing and garnish with parsley. Season with pepper to taste and serve.